It’s been another week of large gains for crude oil, with prices gaining $1.70 between Tuesday’s opening price and this morning. During December, prices rose from an opening price of $57.41 to $60.42, a gain of $4. In just the first few days of January, prices have already risen nearly half of that. The new year is off to an active start, with balancing supply and demand causing markets to swing based on geopolitical headlines. The news of the week, of course, has been protests in Iran. The grassroots nature of the protests led many to believe that Iran could struggle to quell the dissent. Markets feared that protests in Iran could lead to attacks on oil fields, or (less likely) a regime change that would have an unpredictable impact on oil production. After days of protests and dozens of deaths, the government deployed the Revolutionary Guard, Iran’s military unit, to address the tension. As of Wednesday, Iran stated that the protests had ended. Crude oil received a huge shot in the arm from a larger-than-expected crude inventory draw reported by the API on Wednesday, helping to boost prices up above $61. Yesterday, crude prices closed above $62 for the first time since 2014. Despite expectations of crude draws coming, OPIS noted yesterday, “[N]o epiphany suggesting a return to historical norms was noticeable in the trading arenas today.” Markets are enthusiastically trading higher, supported by the fact that prices are at three-year highs. Despite most analysts predicting a correction in the near future, traders appear anxious to push this rally at least a bit further. Diesel prices, already at multi-year highs, stagnated a bit this week, with losses this morning driving the week into negative territory. 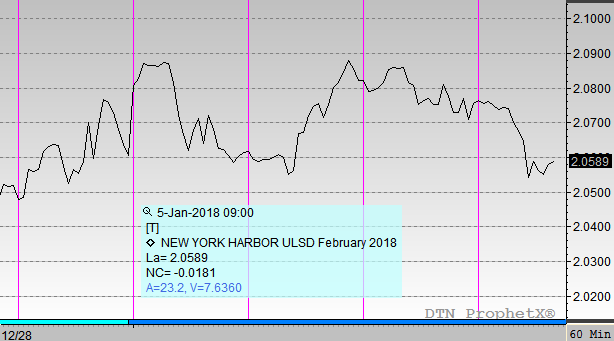 Extremely cold weather has been priced into the market for a while, which has helped keep prices elevated above $2.00/gallon. With the extremely large diesel inventory build, markets cannot justify any further price increases, causing today’s pullback. Diesel began the week at $2.0689, and opened this morning at $2.0801, a gain of over a penny; however, losses this morning could leave prices lower overall. After gaining over 10 cents last week, exceeding +5% in just 4 trading days, further gains seem unlikely in the coming week (though certainly a possibility). More moderate temperatures next week should give markets a chance to recover. 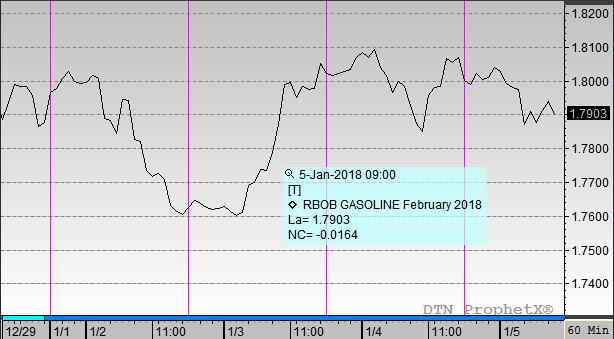 Gasoline saw a big dip to start the new year, generally driven by underlying crude prices rather than any fundamentals in gasoline markets. Refineries are producing gasoline at breakneck speeds, and inventory builds confirmed that fact. While markets expected a 1 MMbbl build, they received five times that amount, keeping gasoline gains mild. Gasoline began the week at $1.7930, and opened this morning at $1.8095. Like diesel, losses this morning have put gasoline prices in the red. Like diesel, gasoline has seen enormous gains over the past two weeks, rising 14 cents (+8.7%). After such rapid gains in such a short time, markets need some time to cool off.